Think about the grease trap in your food service establishment. You’ve seen it labor on through long days, lunch rushes followed by full-house dinners—the silent workhorse of the kitchen that helps keep your commercial kitchen environmentally friendly. But, did you know that the design of your grease trap could have potentially devastating effects on the health of your kitchen staff? When not properly designed and maintained, grease traps can become a breeding ground for bacteria that release hydrogen sulfide (H2S), a pungent and sometimes deadly gas. Older, conventional grease traps are typically metal or concrete boxes in a food establishment’s kitchen or buried outside in the parking lot. While these types of interceptors may succeed at their primary function, they create some potentially serious problems, too. The shape of these traps provides the ideal, stagnant environment for bacteria. These microorganisms settle down in the corners and in the porous, corroded walls. As the bacteria breed, they release H2S. 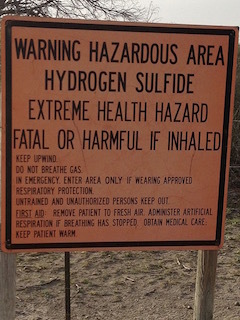 H2S, thanks to its rotten egg stench, is detectable even at very low concentrations in the air. Prolonged exposures to the gas may result in eye inflammation, headache, fatigue, irritability, shock, convulsions, the inability to breathe, unconsciousness and even death. As if the health risks associated with H2S aren’t enough, your plumbing could also be damaged. As the gas-producing bacteria multiply, the water can become increasingly acidic. This can corrode concrete and metal grease interceptors, as well as pipes and other plumbing and sewer infrastructure. Thankfully, H2S issues aren’t inevitable. Not only has better technology allowed the industry to engineer interceptors that minimize those types of problems, but we’ve become more aware of the steps to take to avoid H2S disaster. First, let’s consider the overall design of an interceptor. Modern grease interceptors are shaped differently than their boxy counterparts—they’re now designed with rounded walls to increase efficiency and eliminate hiding spots that could shelter bacteria. With its circular shape, the Trapzilla is a good example of the evolution of the shape of interceptors. The shape isn’t the only thing that’s evolved—materials have as well. In lieu of concrete or metal, grease traps are now made of fiberglass or polymer composites. Take Big Dipper, for example. Though it has an easy-to-clean stainless steel exterior, the interior is made of rotationally molded polyethylene, which nearly eliminates the possibility of corrosion and embedded grease. The size of an interceptor also plays a large role in the prevention of H2S. While large, 5,000 gallon buried interceptors might seem like a good idea, the truth is that the possibility of stagnant, septic water increases exponentially with a supersized trap. Most pump trucks have a capacity of 3,000 gallons, which means that a good bit of the wastewater would stay in the ground, creating the perfect breeding ground for bacteria. Choosing a tank that’s too small brings its list of problems as well, from an increased chance of overfilling capacity to costly associated fines. Modern traps are engineered to have high capacity but be more efficient. Traditional traps can only be filled to about 25 percent of their volume. But innovative grease traps, such as the Trapzilla grease traps, can be filled to upwards of 90 percent of their volume. Though you probably think of a grease interceptor as more of a tool to maintain compliance with wastewater regulations, there are very real safety concerns. And whether your trap is cleaned by employees or by outside contractors, safety starts with choosing the best design. Photo courtesy of Flickr user Earthworks.